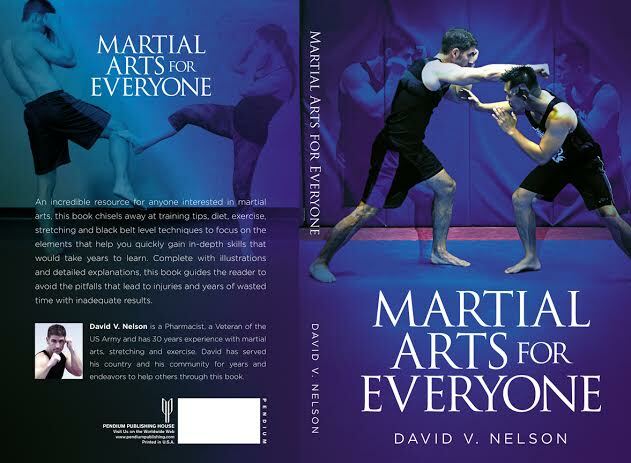 After years of training and research, author David V. Nelson is pleased to announce the release of his new book, Martial Arts For Everyone. Martial Arts For Everyone provides insight from a seasoned Martial Artist with 30 years of experience. David succeeds in addressing Martial Arts techniques in a way that literally everyone can benefit. In addition, the book includes information to help with your healthy diet, proper stretching and training tips designed to assist beginners and experts alike. Optimize your routine and avoid injuries with David’s new book, Martial Arts For Everyone. The price of the new book is $16.99 plus $3.00 shipping and handling. There are multiple ways to purchase Martial Arts For Everyone. To encourage the Paypal and check/money order options, David will sign all copies! Please include who the book should be signed to and any special requests. To purchase by our preferred method, Paypal, follow the link below. The third option is to purchase from Amazon, which will not include the author’s signature.